NCR Forms provide the functionality of carbon paper without the carbon paper. They are available in 2, 3, 4, 5 and 6 Parts colored sets to clearly identify each page of the form. 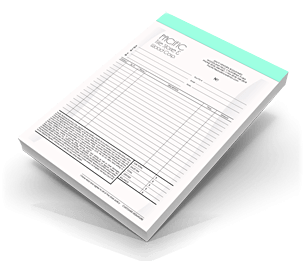 NCR Forms come padded in collated sets pre-printed in either 1 or 2 colors. Numbering can be added if you prefer or when set serialized forms are required. NCR Forms are an efficient way to provide multiple color-coded copies of a single document that includes hand written or typed information. They are the modern replacement for forms with carbon paper. NCR Forms eliminate the carbon mess and are a much more professional alternative to filling out multiple copies of a form on white paper. Use them for forms of all types, such as order forms, packing lists, invoices, and receipts. They are particularly useful where quantities, check marks, or signatures will be added to the form by hand.